Dr. Elia Tait Wojno explores the immune system when it works properly and helps to eliminate parasites, and also when it malfunctions and causes damage, resulting in allergic disease. 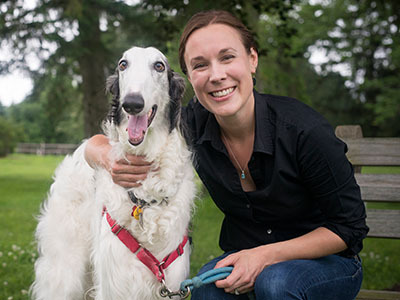 Similarities between dog and human allergies: We are studying blood samples from dozens of canine patients at the Cornell University Hospital for Animals, including dogs with skin itching, redness, rashes, and other allergic signs, and dogs without allergies. We have found that allergic dogs have an overabundance of a specific type of immune cell in their blood, cells which are also found in large numbers in allergic humans and mice. This discovery means that human treatments for these types of allergic signs should be explored for use in canine medicine as well. Studying how lipids and proteins affect inflammation during infection and allergy: We are exploring how the oily molecules called lipids and other protein molecules called cytokines affect the process of inflammation. Inflammation causes some of the signs and symptoms of allergic disease but it also helps the body fight infection with parasitic worms. Understanding how lipids and cytokines work to control inflammation will inform whether these factors are useful targets for drugs to treat allergies or fight parasitic infections. Exploring how the immune system develops: In collaboration with other scientists here at Cornell and at the University of Rochester, we have begun studying how the cells of the immune system develop over a lifetime and what is necessary to make it all work correctly in animals and humans of different ages. 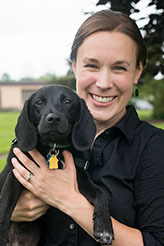 Dr. Tait Wojno discusses her work in a video from our online annual report. Read more about her work in the report.